Panasonic unveils the PT-MZ670 Series of installation projectors, our first range to combine the affordability of 3LCD and long-term cost savings of solid shine laser technology. These innovative projectors include a number of picture-enhancing technologies to deliver brilliant images in environments ranging from bright classrooms to corporate meeting rooms with dim lighting. The series comprises four compact 3LCD lens-interchangeable models, the PT-MZ670 (6,500 lumens ANSI) and PT-MZ570 (5,500 lumens ANSI), both with WUXGA resolution, and the PT-MW630 (6,500 lumens ANSI) and PT-MW530 (5,500 lumens ANSI) with WXGA resolution. The PT-MZ670 series combines outstanding Solid Shine laser with 3LCD technology to produce vivid, crisp images. The projectors offer high brightness of 6500lm (MZ670/MW630), high WUXGA resolution (MZ670/MZ570) and a high contrast ratio (3,000 000:1). The Detail Clarity Processor 4 image processing circuit optimises images, making them clearer and sharper, and is combined with Dynamic Contrast to display text, graphics, and video images with amazing clarity. The Colour Adjustment function lets you correct slight variations in the colour of individual screens, so screens used near each other match. The PT-MZ670 series also features an ambient light sensor which automatically detects the light levels in the room and adjusts the brightness of the image to make it clearly visible in dark or bright rooms. 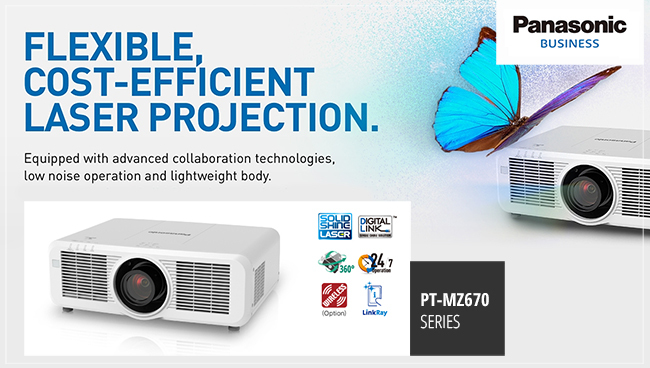 With a small footprint and weighing in at just 15.2kg, the PT-MZ670 projectors are compact and lightweight: a practical choice for use in teaching and meeting rooms. What’s more, the projectors are designed with ultra-low noise operation of 28dB in Quiet Mode – quieter than the sound of writing with a pencil ­– so the audience can focus on the presenter with no distractions. PT-MZ670 projectors are DIGITAL LINK-ready, which means they can be connected to a DIGITAL LINK switcher using a single cable which reaches up to 150m, making installation simple and flexible. The projectors can also be connected directly to a wide range of different inputs and outputs. Thanks to the PT-MZ670 series’ flexible installation options, the projectors can be used in classrooms and meeting rooms of almost any size. set-up features include 360-degree mounting, Powered Focus/Zoom, Vertical/Horizontal Lens Shift, H/V Keystone Correction, 4-Corner Correction, and Curved Screen Correction further enhance installation flexibility. Panasonic has deepened support for wireless projection from mobile devices and PCs with the addition of an optional ET-WM300 wireless module, making the PT-MZ670 perfect for student presentations, interactive lectures, training, brainstorming and other collaborative meetings. Mirroring functionality also joins refreshed Panasonic Wireless Projector apps and Wireless Manager software to allow teams to collaborate freely from any device, supporting wireless projection of a variety of media and business document transmission. With the PT-MZ670 series you don’t need a computer to present thanks to a new Plug and Share wireless feature – just plug a USB and start projecting straight away using the Plug and Share application into the projector to copy configuration data and a lightweight app, plug the drive into a PC, and cast video freely with no software installation or network setup required.